Anointing breaks the yoke – as a blind woman regains her sight in The Synagogue, Church of All Nations after using anointed water. Mrs Felicia Okara came to The Synagogue, Church Of All Nations on Tuesday, the 5th of January with the problem of blindness for over six years believing that God would surely use Pastor TB Joshua to deliver her and make her regain her sight. The River State indigene, Okara, also cried out that she had been operated on but all to no avail. “I have been operated, but no solution” said Mrs Okara. The man of God, Pastor TB Joshua prayed and instructed that her daughter, Success Okara, 14, should spray the anointed water into her mother's (Mrs Okara) eyes. 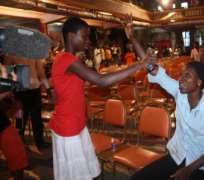 Instantly, Mrs Okara regained her sight as the anointed was sprayed into her eyes. The crowd jumped into excitement was to strengthen their faith in the belief that God is indeed a miracle working God. Imagine what it is like "if you could keep your eyes closed just for one week... it's amazing what you see when you open your eyes again. This is indeed a better way of starting the New Year after being out of sight for six year. She was over joyous and full of thanks to God Almighty. Mrs Felicia Okara testified on Sunday, the 10th of January 2010 in the Synagogue, Church Of All Nations in front of a large congregation of how God used the Pastor, TB Joshua to deliver her and regain her sight through the anointed water. “It was a terrible ailment to experience. To the extent that you cannot know the person next to you. But Jesus the author and finisher of my faith – He has perfected me today through this anointed water. This is my last bus-stop”; said Mrs Okara. Her 14 yr old daughter, Success Okara, further explain what they passed through due to the problem and how their Father let them because he felt their mother's blindness was a family problem. Success also thanked God for healing and delivering her mother from the blindness of six years.